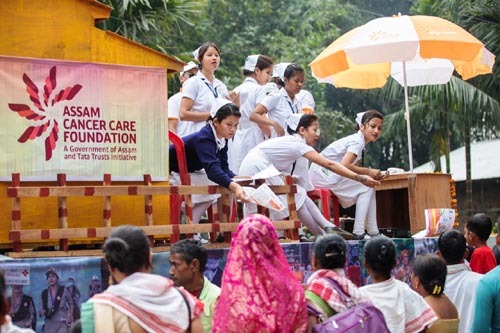 The Assam Cancer Care Foundation (ACCF) created awareness among lakhs of people about oral, breast and cervical cancer at the 88th Annual Conference of Sankardev Sangha in Morigaon district. For the first time in the history of Assam, such a large number of people was made aware about the disease. During the four-day event organized from February 6-9, ACCF sensitized the visitors about the importance of screening of common cancers after the age of 30 years while raising awareness about the health hazards that are caused due to consuming tobacco. It is to be mentioned that 48.2 per cent adult population in Assam consume tobacco products due to which every year 32,000 new cancer cases are detected. ACCF had designed diverse strategies to reach out to an expected gathering of approximately 30 lakh people and the highlight was the tableau – a 3D model of Health and Wellness Centre. The Foundation, in collaboration with District Tobacco Control Cell created a ‘Tobacco-free Zone’ by law enforcement through police, youth volunteers and display of signage at different locations of the conference area. ACCF facilitated in the enforcement of ‘No Tobacco Zone’. Awareness kiosks were placed at 20 different places of the entire conference area. In the four day session, 150 NSS volunteers from Morigaon, Jagi Road and Mayong College participated in the awareness campaign and the cultural procession. The entire session helped in raising awareness about common cancer to lakhs of people gathered in the four days conference. A talk show on Cancer was organized for youth which witnessed encouraging participation from rural and urban youngsters.